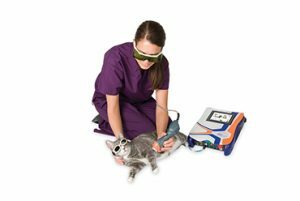 Cutting Edge Laser Technologies, a Fairport, N.Y., provider of laser technologies for veterinary and medical professionals worldwide, has entered into an exclusive partnership with Greely, Colo.-based Patterson Veterinary. Patterson Veterinary will be distributing multiwave locked system (MLS) therapy lasers and surgical lasers nationwide with Cutting Edge. Cutting Edge currently serves more than 10,000 medical and veterinary professionals worldwide. “By bringing together the research, development and educational resources of CE Laser, and Patterson’s world-class distribution and sales capabilities, we expect to provide our veterinary clients significant practice enhancing benefits and support,” said Dan Reinhardt, director of marketing – equipment at Patterson. The MLS therapy laser is an easy-to-use, noninvasive tool for treating acute and chronic pain, post surgical pain, pain associated with arthritis, IVDD, sprains/strains, muscle trigger points, and both contaminated and noncontaminated wounds, according to Laurie McCauley, DVM, DACVSMR, CCRT, CVA, CVC, a Cutting Edge laser user since 2010.